PSNI Chief Constable George Hamilton has not shown that a legacy unit within his force has the practical independence for a new probe into the suspected military killing of a woman in west Belfast 47 years ago, the Court of Appeal ruled today. Senior judges also declared that Mr Hamilton is under an obligation to further investigate the death of Jean Smyth in a way which meets human rights requirements. Jubilant relatives of Mrs Smyth hailed the verdict as a victory in their campaign for inquiries to be overseen by an outside agency with no links to the Ministry of Defence (MOD). 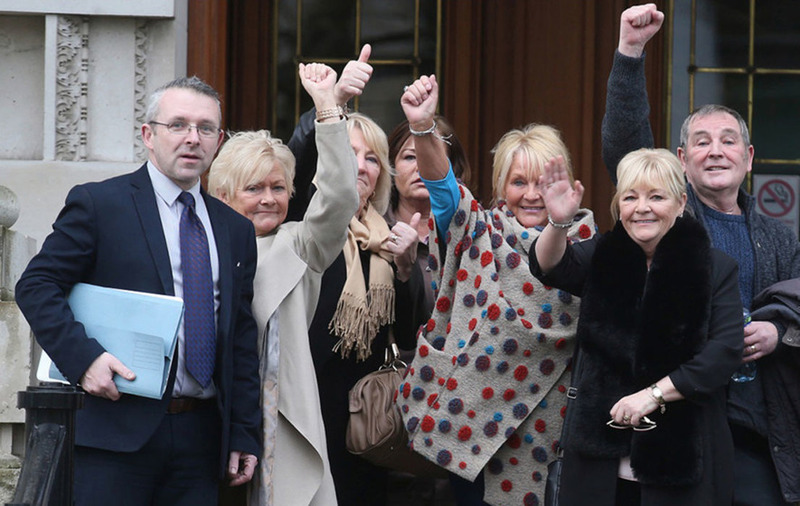 Her sister Margaret McQuillan said: "I'm absolutely over the moon, we have been fighting for the truth about what happened to Jean for 47 years." The 24-year-old mother of one was killed by a single shot to the head as she sat in a car on the Glen Road in June 1972. At the time the RUC informed her family that it was probably an IRA gunman who opened fire. But records uncovered at the National Archives in Kew, London in 2014 suggest the British army's Military Reaction Force (MRF) fired shots in the area and were allegedly involved in her killing. During court hearings it was stressed that Mrs Smyth was a wholly innocent person in the wrong place at the wrong time. Counsel for the family had argued that fresh evidence links the British state's own agents to the killing of an innocent citizen. It was claimed that uncovered material points to MRF involvement in a systematic abuse of force, with the truth concealed in the past by both army and police officers. The findings of two previous probes into the death were flawed and undermined public confidence in the PSNI conducting an impartial investigation, the barrister contended. Lawyers representing the chief constable had countered that the PSNI is "institutionally distinct" from its RUC predecessor and has the independence required for a new investigation. In 2017 a High Court judge found that the family of Mrs Smyth have been let down for decades by the criminal investigation system. He concluded that the PSNI's Legacy Investigation Branch (LIB) lacked the required independence to carry out further investigations into her death. Ruling on an appeal against that judgement, Lord Justice Stephens set out how 27 of 55 members of staff had formerly served in the RUC. He also pointed out: "It would have been obvious in 1972 that members of the army were on the Glen Road at the time of the deceased's death and their activity should have been but was not investigated by the RUC." Material available to the now-defunct Historical Enquiries Team (HET) in 2006-2008 should have led to an investigation of potential MOD involvement in the killing, the court found. Without any available statement on planned arrangements to be put in place, Lord Justice Stephens said: "We conclude that at this time the chief constable has not demonstrated practical independence on the part of the LIB so that it has the capacity to carry out an investigation into the death of the deceased." The court granted a declaration that the chief constable is obliged to conduct the further investigations into Mrs Smyth's death in a way which satisfies the State's procedural obligation under Article 2 of the European Convention on Human Rights. It further declared that the chief constable is bound to promptly take steps to secure the practical independence of the investigators so that they have the capacity to carry out an Article 2-compliant, effective investigation into the killing. Outside court legal representative Niall Ó’Murchú claimed the decision shows PSNI officers cannot oversee any further probe. He added: "We also expect that the chief constable will not appeal this to the Supreme Court."